While I was teaching to the expectant mothers, we had a discussion on how important it is to set goals and to dream. I challenged all of the women to think of one achievable goal that they could work towards. Something that would challenge them, yet be achievable with persistence. I asked all of the women to stand up and share their goal with the group. To my surprise they were very eager and willing to share their dreams. St. Jules has a dream to learn how to sew. Minedraine is currently living with a friend and would like to purchase her own home. St. Louis would like to finish cosmetology school after she has the baby. Guerrilla would like to send her children to school someday. Then sweet Eveline bravely stood up and said, “I would like to learn how to read and write. I do not even know how to write my name.” It literally brought me to tears because I was incredibly proud of this brave, 22 year old woman who stood up amongst the group to share her dream (even as others snickered and made fun). 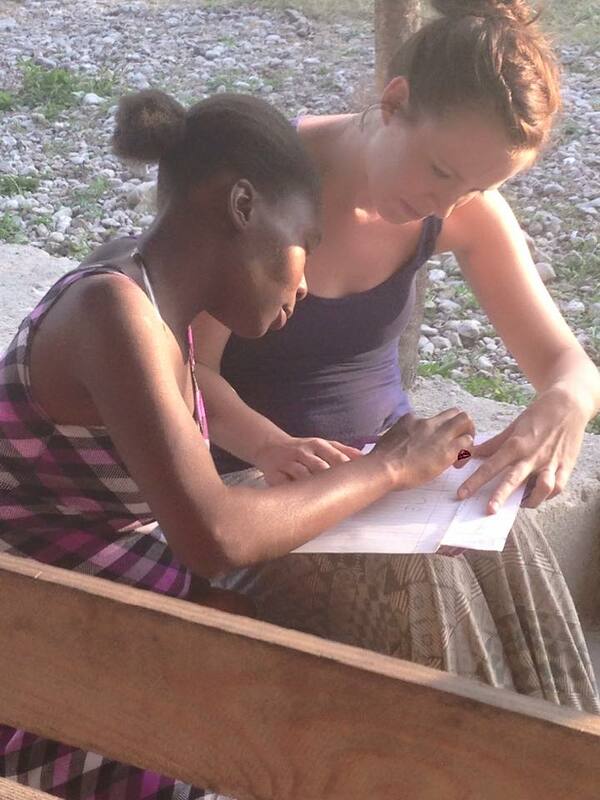 Jaime teaching Eveline how to write her name. My heart swelled as I had a “front row seat” in watching the power of investing into another person’s life. Two days later, one of our team members (Jamie) gently pulled Eveline aside after bible study. 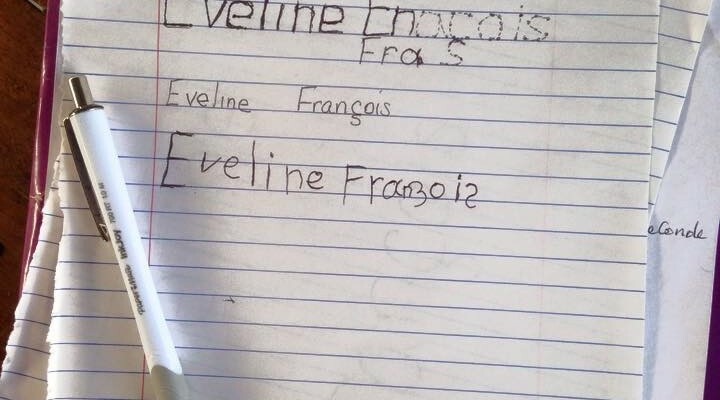 We watched her patiently show Eveline how to write her name. Eveline was grateful. 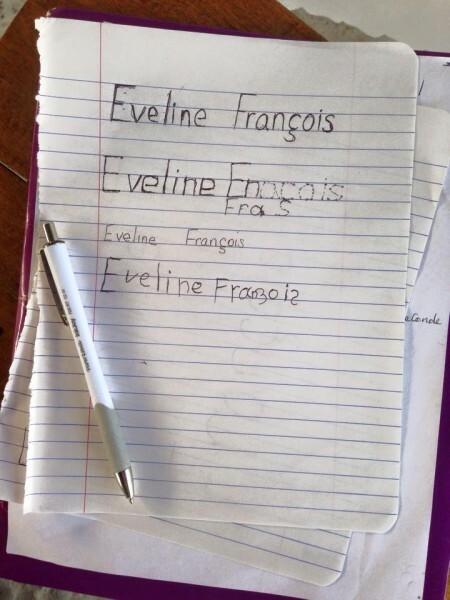 And I’m sure she is happy that she now knows how to write her name. But it actually runs deeper than that. Because Jamie was able to be the “hands and feet of Christ” and pour love into her life. Something that Eveline will remember forever. I was reminded once again that the investment of our time, talent and wisdom are far more valuable than anything we can offer through worldly processions. Because what man needs the most is love, relationship and a whole lot of Jesus. We may not be able to change the world alone. But we can cast stones to create a ripple effect in hopes that they will then cast a stone in return. We may not be able to change the world alone but we can achieve it together. Sometimes we get discouraged when we don’t see the results we believe should happen in the timing we believe. But sometimes its just a matter of time for things to bloom and flourish. They may live in a place where life is hard and dreams are harder to achieve. But their dreams and goals aren’t unachievable. They are achievable through love, wisdom and encouragement. Through investment from others around them and within themselves.